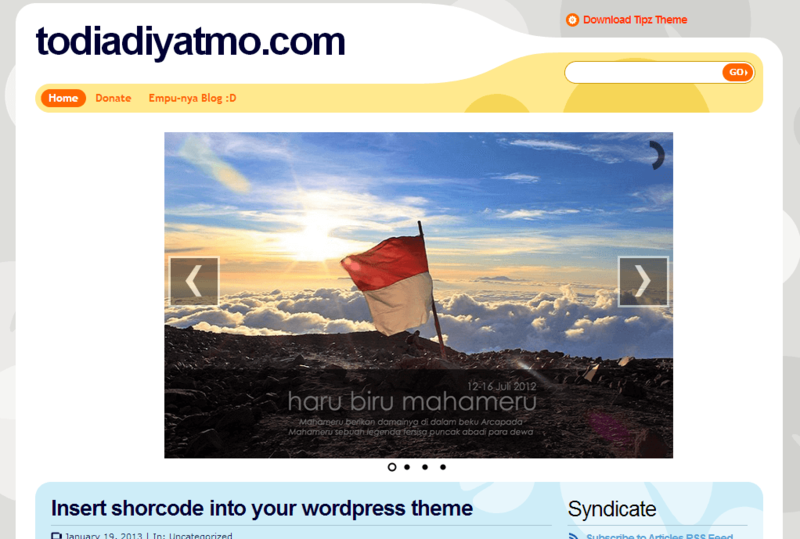 Insert a shortcode to theme is a bit tricky. Calling the shorcode is easy, the problem is where to put the shortcode. To properly insert a shorcode to desired position in your theme need a little HTML knowledge. The first two step is easy. The third step is a little bit tricky.After you get an idea of where the slideshow will go, do a right click on that area (on your google chrome browser) and select inspect element. In the picture above, the closest div within my click is having class=”mp”. Now remember this <div>class as we going to insert the shorcode bellow/after the div. 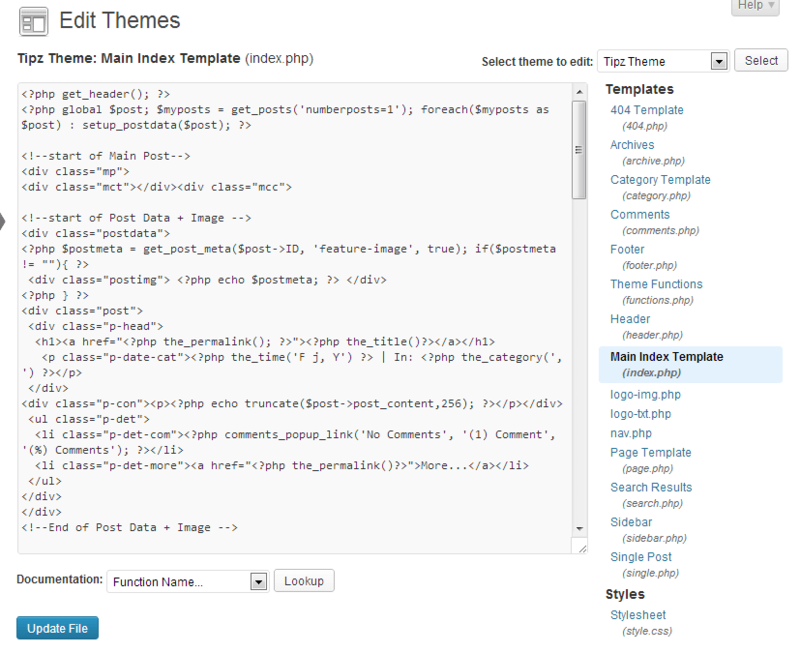 To edit your theme file go to your admin page, on the left sidebar choose : Appearance -> Editor. Before we continue , i will notice you that editing your theme file can be dangerous. If you do something wrong ( ex: accidentallyerasing some tag ) your web would rendered incorectly or not working at all. Always make backup before you do any change. Within the editor there is a lot of that used by your theme to render your web. . Everytime you load your website, wordpress would could index.php / home.php file depending on your theme structure. The general rule of thumb is : if there is a home.php file, your home / landing page structure is defined in this file but if the home.php dot not exist, you must check your index.php to find the home section. Index.php file must exist on every worpress theme file while home.php is optional. As you may see that on index.php case there is extra is_home() function to be called. The function is to make sure that the shortcode is only called on your home section. After adding those lines save your file and check the result by going back to your website. If all the step was done properly the shortcode should call the desired plugin. You may see that on most file there is a comment tag arround the <div> that help you to put the shortcode. Most themes have this comment, but some are not. In some case maybe you need to add extra css style to make the plugin looks properly. But there’s beyond the scope in this tutorial. 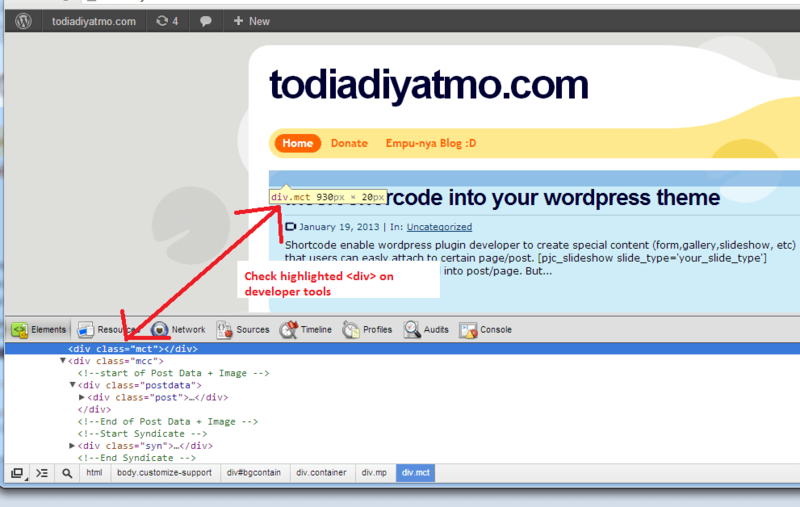 The do_shortcode function depends on the global state of wordpress. Maybe it’s not available. What plugin to be exact? the do_shorcode is not working… I understand need to focus on payment plugin, but the free version, does not work.